The 2016 TOSA Decathlon will be held September 25-27 in Sebago, Maine. There are 14 participants currently signed up for this epic event. If you would like to participate, please respond directly to our CEO, Gary Bernklow, at ceo@tosalumni.org. This year’s events include tomahawk throwing, double-ball, knots, darts, badminton and other assorted Scout skills and yard games. Jack Curtis will be defending his title from the past two years while the rest of the field does their best to take him down. 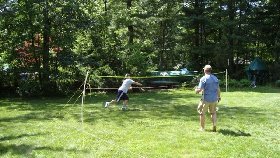 The rugged Badminton competition is always a crowd favorite. Here, CEO Gary Bernklow cleans up against CFO John Wood. Just one of the many competitions in the annual TOSA Decathlon. Contact the CEO for more information.